The BA25 is a 32-bit processor for demanding systems running applications on general-purpose operating systems such as Linux and Android. The high-performance BA25 processor runs at high clock frequencies yet has a smaller silicon footprint than most competing application processors (e.g., over 1100MHz and from 145k sq. um in TSMC 28nm HPM, including the FPU, and excluding SRAMs). This royalty-free 32-bit processor core is binary-compatible with other members of the silicon-proven BA2x processor family. Its BA2 instruction set is relatively simple and extremely compact, offering system area and energy savings benefits. Programing is facilitated with the included C/C++ tool chain, Eclipse IDE, architectural simulator, and ported C libraries, RTOSs, and OSs. The seven-stage pipelined architecture runs at high frequencies and further enhances performance by supporting out-of-order execution and branch prediction. An optional IEEE 754 compliant floating-point unit accelerates floating point computations. 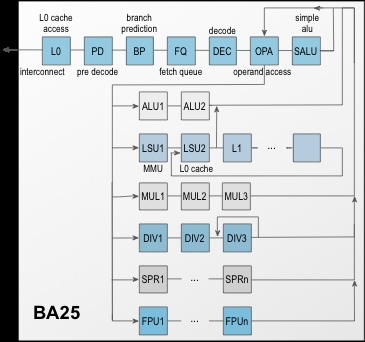 The BA25 processor uses two-level data and instruction caches—with L0 running at the CPU’s clock frequency and L1 running at half that—and a two-level memory management unit. The size and associativity of the caches and MMU are configurable at synthesis time. The system interface uses two AMBA® AXI4™ buses, one for data and one for instructions, both of configurable data width. Two tightly-coupled quick memory (QMEM) buses allow fast access for time-critical code and data, and can be used for inter-core communication in a multi-core architecture. The energy efficiency BA25 enables power management with clock gating and power shut-off of unused units, and through software and hardware control over the clock frequency of the CPU and buses. Wake-up from sleep mode is triggered by an interrupt issued by the embedded tick-timer or by an external source. The core is available for ASICs in synthesizable Verilog source code or for FPGAs in optimized netlists. It includes everything required for successful implementation: extensive documentation, a testbench, sample synthesis and simulation scripts, and the BeyondStudio™ Eclipse-based software development IDE for Windows and Linux. Reference designs on FPGA boards are also available; contact CAST Sales for information. The royalty-free, high-performance BA25 processor core is suitable as the main system processor in a multitasking environment and is a competitive choice for designs running full operating systems such as Linux or Android.